AMD may have just been saved by the success of the PS4 and Xbox One consoles, if their Q4 2013 results are any indication. Before this, the situation was looking increasingly more dire, and many were wondering if they will even survive another year or two on their own, without going bankrupt or being acquired. Thanks to the next-gen consoles, they may have delayed that outcome for a while, but they can’t get any rest any time soon. 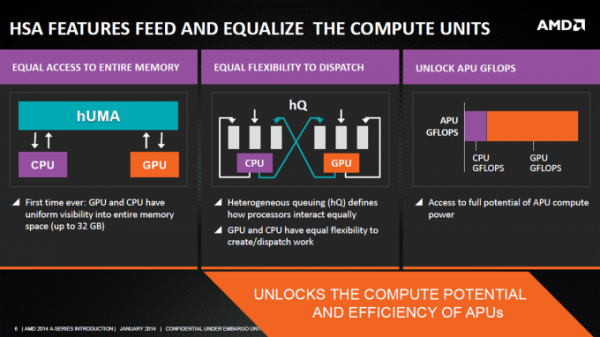 AMD needs to keep the momentum going by putting all of their efforts into making HSA (Heterogenous Systems Architecture) a “thing”, before the console sales won’t be enough for them, and before competitors come out with strong alternatives to HSA. Recently, they showed off Kaveri, the first APU to truly take advantage of HSA, from any of the members of the HSA Foundation, which also includes all the major ARM players (ARM, Samsung, Qualcomm, Imagination, and others). But this won’t be nearly enough to make HSA popular. AMD has enough problems on its own with making any of their chips popular, considering Intel dominates the PC market, and AMD is non-existent in the mobile market. So they need to get the ARM players to take HSA seriously, too, and they need to do it soon. Why soon? Because HSA and the corresponding HSAIL virtual ISA are already starting to see competition from OpenCL/SPIR, CUDA/PTX, and Intel’s own Phi architecture, that promises to do away with GPUs completely, and just use CPUs for everything. AMD is ahead with HSA technically, right now, but this advantage will eventually fade away, and that’s why it’s important for AMD to gain market momentum in order to make the competing standards irrelevant. The nice thing about HSA is that it’s completely architecture agnostic, and if it does gain any momentum, it’s going to make GPU compute applications several orders of magnitude more popular than they currently are with OpenCL or CUDA alone. Other than some odd exceptions, you’ll never see OpenCL or CUDA-based apps, because developers won’t take the time to learn these new low-level languages in order to gain some extra efficiency. But with HSA, they’ll be able to program in the same languages they’re already used to, and then have their code run on any HSA-enabled architecture. I think the idea of HSA is a great one, which is why I hope AMD and ARM start pushing it more heavily soon. If HSA becomes popular, that should also give AMD an edge, because the same apps or games that will be optimized for HSA on ARM chips, should be able to take advantage of that HSA-optimization on PC’s, too, something that can’t be said about Nvidia or Intel, since they are not HSA members (at least not yet). By helping make HSA popular on mobile, AMD can leverage that success in their favor on PC’s, and if they ever decide to get into mobile, too, it should make that transition a lot easier for them.